…get into the habit of appreciating and valuing commitment and loyalty. These habits once learned and continuously practiced enable us to reap a character that is good and loving, kind and compassionate. 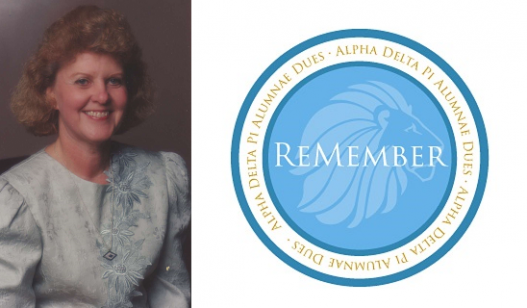 Whether you serve your family, your community, your career, or Alpha Delta Pi, or all of these, the habits you practiced as a beginning Alpha Delta Pi are never out of date and never out of style. Mother Mannle’s challenge still holds true 25 years later. Each year our alumnae membership grows, as does the cost of providing alumnae services. I am asking you – our alumnae – to “get into the habit” of living our values and giving back to the organization. Today, the asking contribution is $30, but any amount is accepted. Log on to Pride Online for more information and to pay your ReMember Dues. ReMember Dues are not tax deductible as charitable contributions for federal income tax purposes.